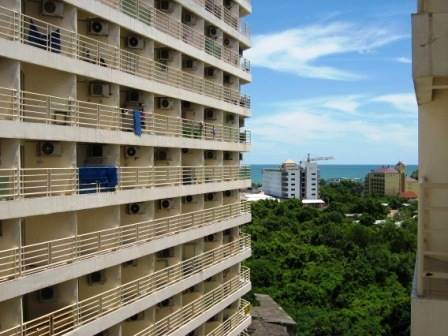 Jomtien Beach Condominium building A3 floor 10, 29 square meters on Jomtien Beach Road. Back Studio with bathroom, nicely furnished, with sea view. 1 air con, 1 ceiling fan. Facilities include 24 hour security, 2 swimming pools, exercise room. For sale at 1.15 million or rent at 11,000 Baht per month. Foreign ownership. Our reference JTC1030.